Don't trust your Bible study to a mere web search. Discover the power of SwordSearcher: A complete Bible study package, with thousands of topical and encyclopedic entries all linked to verses, designed for meaningful Bible study. The Cyclopedia of Biblical, Theological, and Ecclesiastical Literature. James Strong and John McClintock; Haper and Brothers; NY; 1880. Source: McClintock and Strong Cyclopedia book module from SwordSearcher. 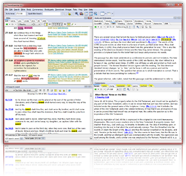 Verse reference tagging and popups powered by VerseClick™.